Our visit to Dubrovnik, Croatia kicked of with a.. um, well, a bumpy start. From my window seat, something seemed off about our descent into Dubrovnik. It was hard to explain; until the last few minutes of our approach, it had been like any other flight. The captain told us to fasten our seatbelts, the flight attendants prepared the cabin for arrival, but as the plane glided back toward the earth it seemed like we were flying in a bit too fast and the winds were becoming a bit too strong. The view was beautiful. The landing? Not so much. “I think we might overshoot the runway,” I said to Adam. The woman next to him gasped; maybe I should have said that a bit more quietly. But as the plane got closer and closer to the ground below us it seemed very clear we were going much too fast to connect with the runway. The winds were really picking up at this point, creating serious turbulence. As my brain tried to process what was about to happen, the plane sped up and shot back up into the sky. For five minutes, no one said anything. No one moved. I watched as the world got smaller and smaller until a fluffy layer of clouds came between the plane and Croatia. Finally, the pilot’s voice crackled over the loudspeaker. “You may have noticed we haven’t landed yet,” he said. “As we started our final approach the wind picked up at speeds that overwhelmed the aircraft, so we decided to abort the landing. Good news, though! It looks like the winds have changed, so we think we’ll try this again.” I glanced at Adam. I would have loved a more self-assured statement; we’ll try this again didn’t really suggest confidence. Our second attempt at landing was successful, and as the plane taxied to the gate we broke out in a spontaneous, enthusiastic round of applause for our pilot. 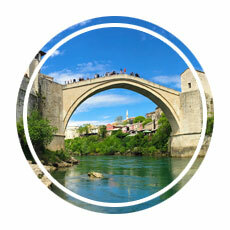 By the time we had collected our luggage and cleared customs we had shaken off our nerves. When we met our shuttle driver and he asked about our flight, we were quick to say it was great. 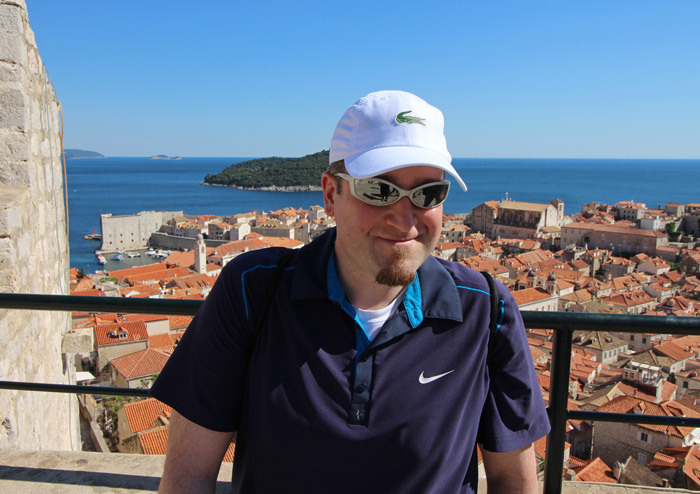 Later in our trip we would learn than ours was the only flight to land in Dubrovnik that day. Other flights had to give up all together and land in Split, four hours to the north, which meant passengers had to take buses back to Dubrovnik—and after factoring in a border crossing into and out of Bosnia on that route, it would have added six hours to our travel time and prevented us from sightseeing in Old Town Dubrovnik. 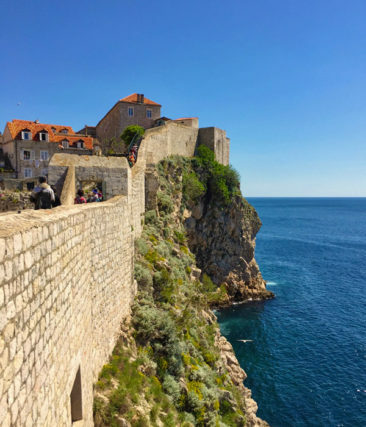 Fortunately for us, we landed just a few minutes late and had an entire free day to enjoy the city- and Dubrovnik is a very easy city to enjoy! 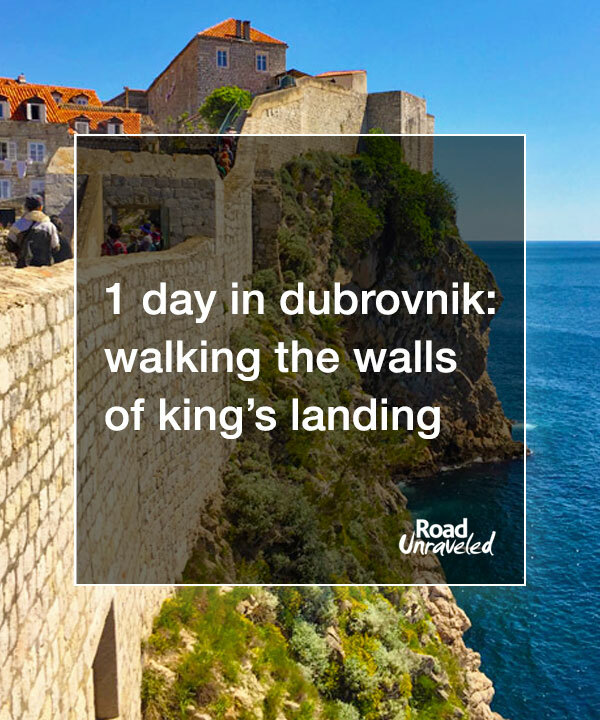 Here’s what you can’t miss if Dubrovnik is in your plans. 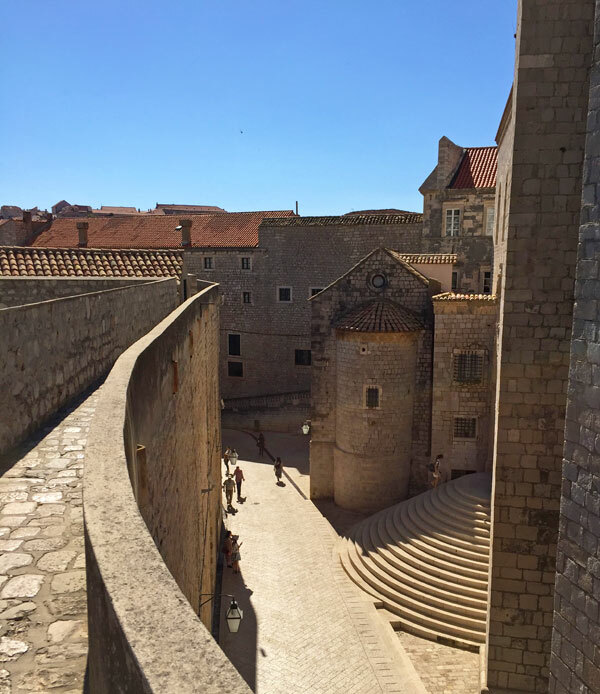 You can see many of Dubrovnik’s highlights by walking through its Old Town, so after checking into our hotel we took a five minute walk from the hotel to the Pile Gate to start our exploration. Entering through the gate places you at the end of the stradun, the main street that runs through the old city. Standing in that spot affords you your first look at the city’s historic architecture that dates back to the 15th century. It also serves as a reminder that the city is well aware of its connection to tourism- every building hosts a restaurant, a gift shop, or a gelateria to entice visitors to spend their money. Dubrovnik is quickly becoming a hot spot for Hollywood, and a quick walk through the gift shops will provide the evidence. 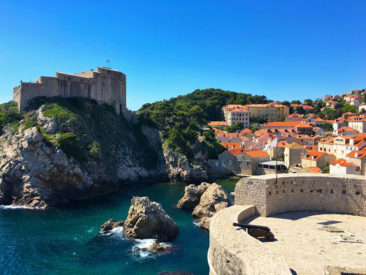 The popular HBO series Game of Thrones is filmed here and you will find an enormous amount of souvenirs related to the show and the fictional city of King’s Landing. They even have Game of Thrones tours around the city that highlight some of the main filming locations. The upcoming Star Wars: Episode VIII was also filming here just weeks before our visit. We skipped the tourist traps and the food during our first pass through and instead focused on the beautiful buildings and the history, and we recommend that as a strategy when you first arrive. Sure, you’ll find plenty of people standing on the street offering you menus to peruse (and if you read about our adventures in Venice, you know that’s a pet peeve of mine! ), but we found we were much happier to bypass the noise and focus on the sights of the stradun before deciding where and how to spend our money. At the southern side of the Old City, in Gundulic Square, sits the Church of St. Ignatius of Loyola, a Jesuit church completed in 1725. We entered on a whim (partially to escape the sun, partially because we love old churches), and this one boasted some of the most beautiful frescas we have seen. We were the only visitors for the fifteen minutes we stayed there, which gave our visit a more intimate feel, but it’s worth the hike up a pretty steep baroque staircase (modeled after Rome’s Spanish Steps!) 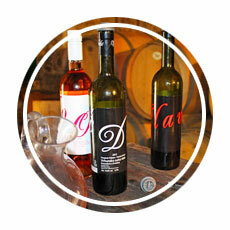 to visit. 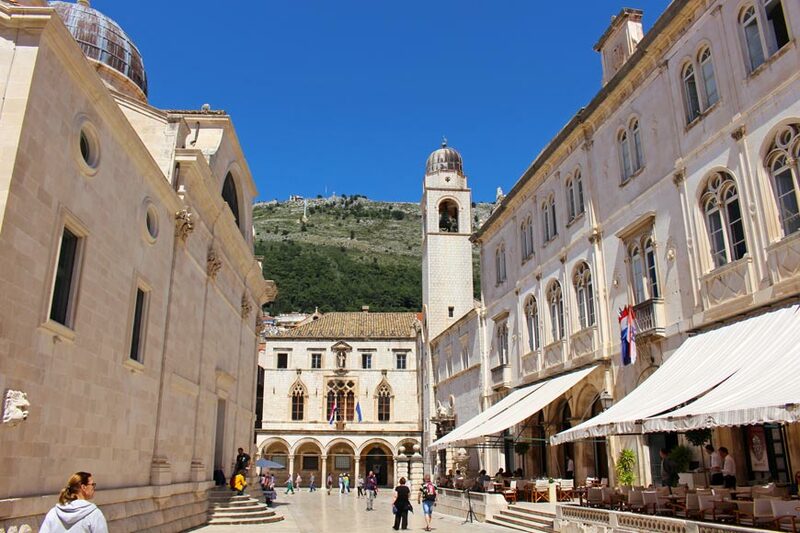 You can’t miss Luža Square; if you walk down the stradun you’ll reach it when the street ends and opens up into the busy gathering place for tourists and locals. This is where you’ll find a few buildings of note. Weary travelers who have spent the day hiking along the city walls can be found resting their tired feet on the steps of St. Blasius Church. St. Blasius- or St. Vlaho in Croatian- is the patron saint of Dubrovnik, and you’ll find his likeness everywhere. He watches over those who pass through the gates, and his image is carved into the city walls. 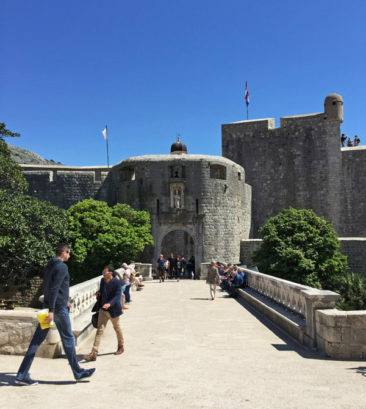 In 971, St. Blasius is said to have appeared to alert residents of an impending attack by the Venetians, giving Dubrovnik enough time to close the gates and man the walls. When the Venitians arrived, seeing the city was guarded, they sailed away. You’ll also see the bell tower, soaring high above the square at just over 100 feet tall. Built in the mid-1400s, the clock still chimes every day at noon. The bell strikers are two bronze statues named Maro and Baro, who are affectionately referred to as “zelenci,” or the Green Twins, because over time exposure to weather has turned them a shade of green. Just below the bell tower stands Orlando’s Column, a piece of stone with the image of a knight carved into it. 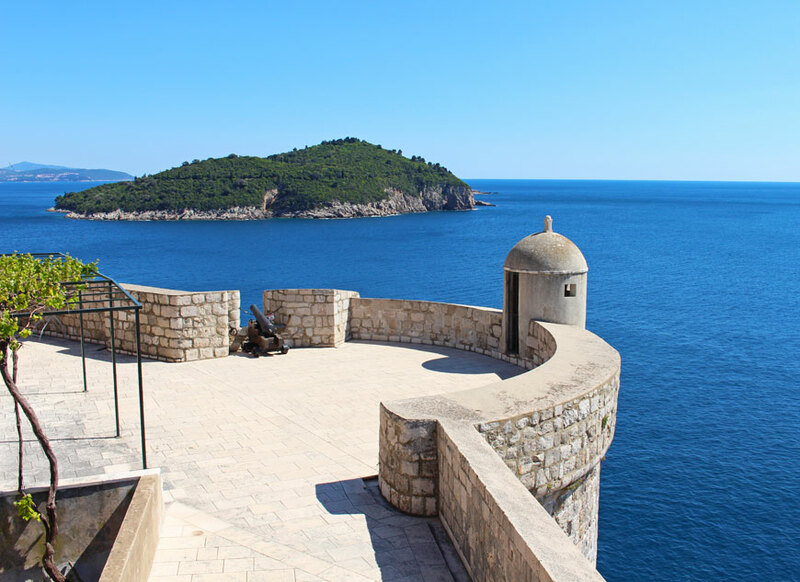 According to legend, the knight, Orlando, saved Dubrovnik from a siege in the 9th century, and his statue symbolizes freedom for the city. 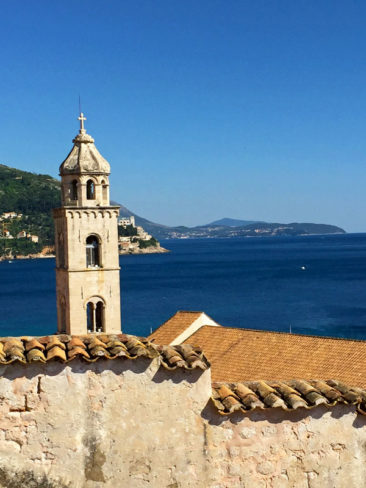 Perhaps the best way to see Dubrovnik is from above. 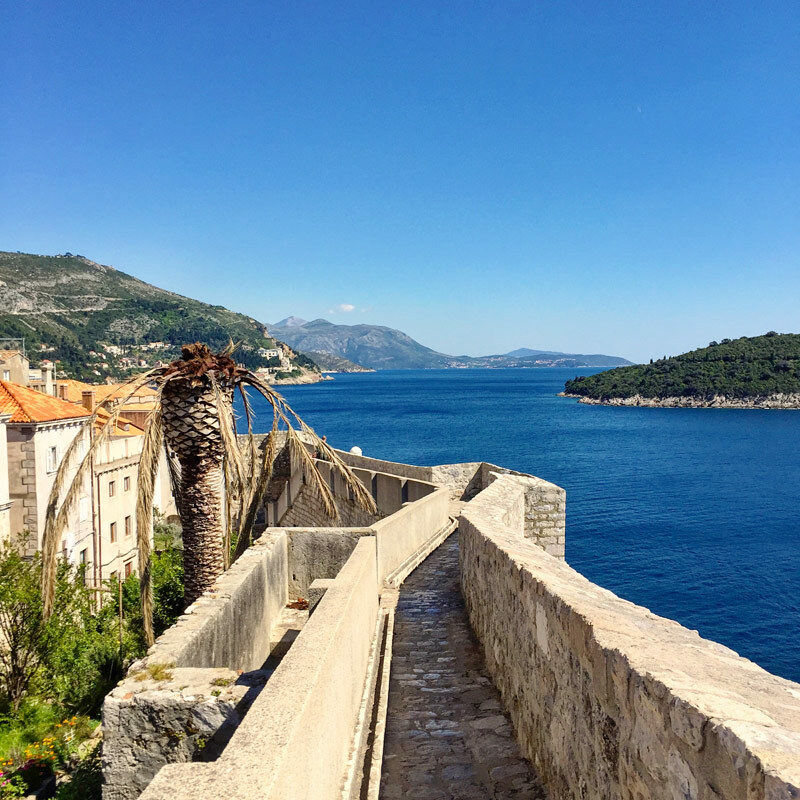 We spent close to three hours hiking the City Walls, which are incredibly well-preserved and famed for providing access to picturesque views of the Adriatic Sea. 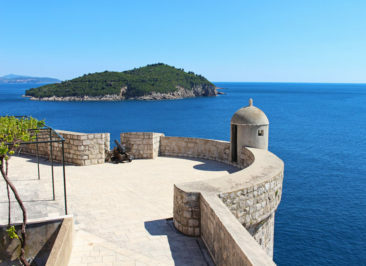 Perhaps the highlight of the walk is the Minceta Tower, the highest point of the walls that offer some of the best angles and panoramas for visitors to see Dubrovnik. 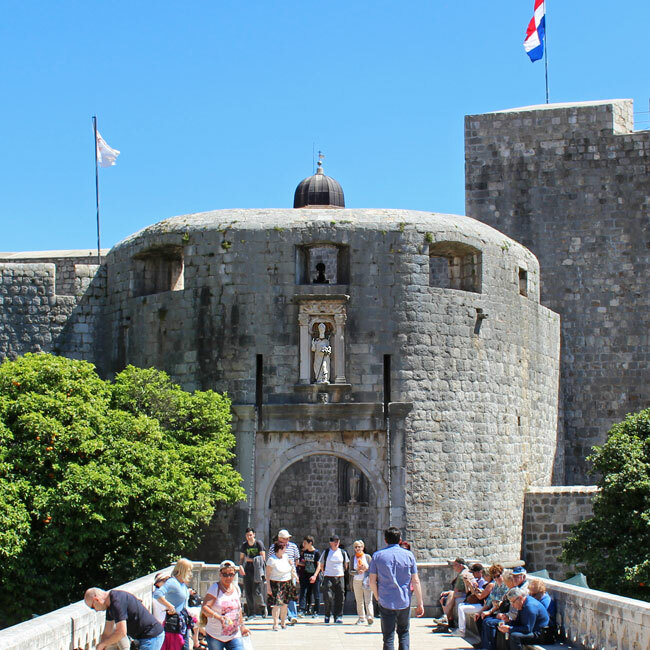 The tower was originally built in the 1400s, and it was a square structure until the mid-1500s when it was fortified with thicker walls and took on the circular shape it has today. We enjoyed relaxing here; it provided the best sweeping views of the red roofs, the historic structures, and the blue sea, and it gave us some of the more quintessential images from our stay in Dubrovnik. That being said, my favorite part of the wall was that which winded along the coast, where we could stare out into the distance without seeing so much as a boat on the horizon. Not far off the coast is Lokrum, a gorgeous island that can be visited by those who want to see its botanical gardens and beaches, although it’s beautiful from a distance as well. Interestingly, despite the fact its desirable location would suggest it would be a great place for a hotel or resort, no one stays there overnight. Legend has it that the island is cursed- after a monastery was closed and the Benedictine monks were expelled from the island by the French, the monks are said to have placed a curse condemning anyone who tried to take and use the island for their own pleasure. Several deaths have been reported that relate to people who have tried to take the island as their own, so to this day no one sleeps on the island overnight. 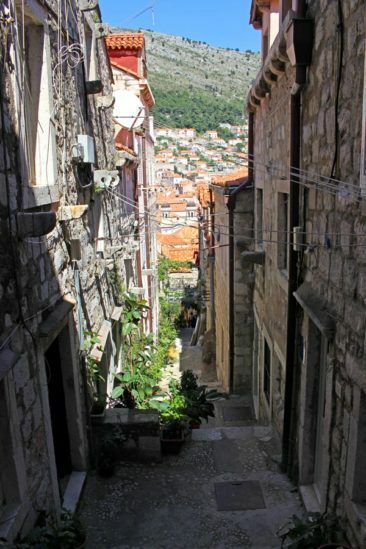 You’ll also have an opportunity to see some of the damage done to the buildings of Dubrovnik during the 1990s, when the Siege of Dubrovnik led to the bombardment of the city and the damage or destruction of a significant part of it- in fact, an estimated 68% of all buildings sustained damage and nine were completely destroyed. 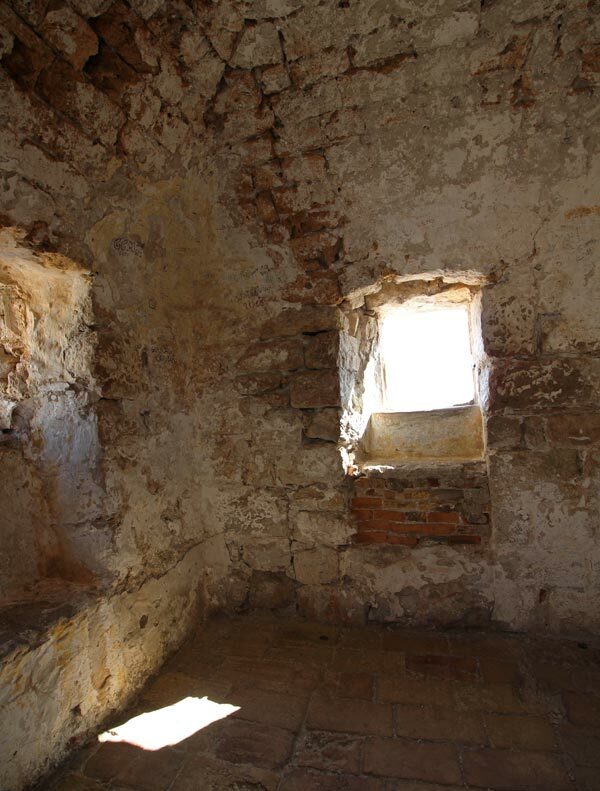 It’s an important part of the city’s history and identity, and while many buildings have been repaired evidence of the horrors the city faced are still present. You’ll also note the city walls themselves don’t reflect a great deal of damage; this is a great testament to the strength and resilience of the ancient construction. There aren’t a lot of places to purchase water during your walk along the walls, and if you’re out during the warmer hours you’ll want a bottle or two. During the height of tourist season in the summer, you’ll have a lot of company as you walk. We spent part of our walk stuck behind a huge group of visitors who walked slowly and weren’t inclined to let us pass them, which slowed us down at points where we wanted to move faster and occasionally prevented us from getting the photos we wanted. It’s worth going early or delaying your visit to avoid the key times when the walls will be the most busy. 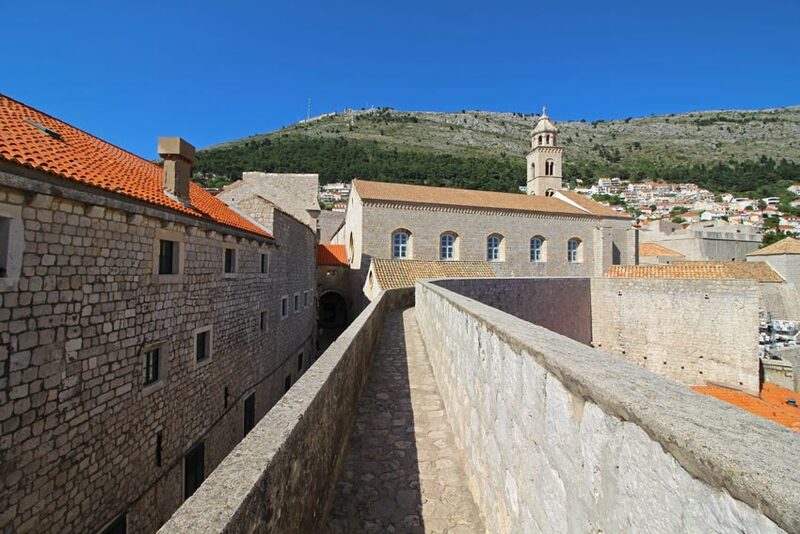 There are a couple of entry points to the Dubrovnik walls, which means there are a few places where visitors might either make the climb up or down. Your tickets will be checked at these points to be sure you’ve paid, so if you’re not inclined to keep your tickets as souvenirs hang on to them until you’re done with your visit to avoid paying again or being sent away before your climb is finished. We ate well in Dubrovnik, and if fresh seafood and Mediterranean cuisine is something you enjoy you’ll love it, too. Those people behind us walked right into our photo. Thanks, guys! 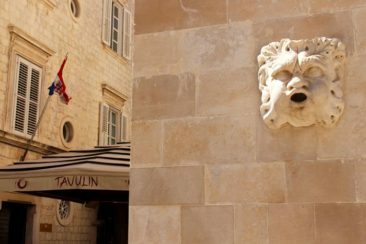 The restaurants in and around the old city are expensive- even overpriced- but we tried one anyway because we wanted the experience of eating among the beautiful buildings. We picked Proto, partially because the menu looked great and the reviews we saw on foursquare looked wonderful, but mostly because the manager outside wasn’t pushy and let us spend some time looking over our options without a high-pressure sales pitch. That won them some business from us! Many restaurants offer a local fish soup, and we loved the version we tried, which was loaded with fresh fish in a clear broth. I had an incredible scallop dish with Israeli couscous, and Adam enjoyed the catch of the day. We also shared olives and dumplings, a local recipe. Like Italy, Croatia has some great olive oil, and while we only sampled a bit of it on some fresh bread with our soup the olives were pretty delicious. We got a great deal for our stay at the Hilton Imperial Dubrovnik, and it met all of our needs: it was incredibly quiet, we had a comfortable bed, a large bathroom, and the Wifi was fast for all of our devices. The location is perfect: just a few minutes walking distance to the city wall and the old town, which makes exploring, shopping, and sightseeing very, very easy if you’re not familiar with the city. 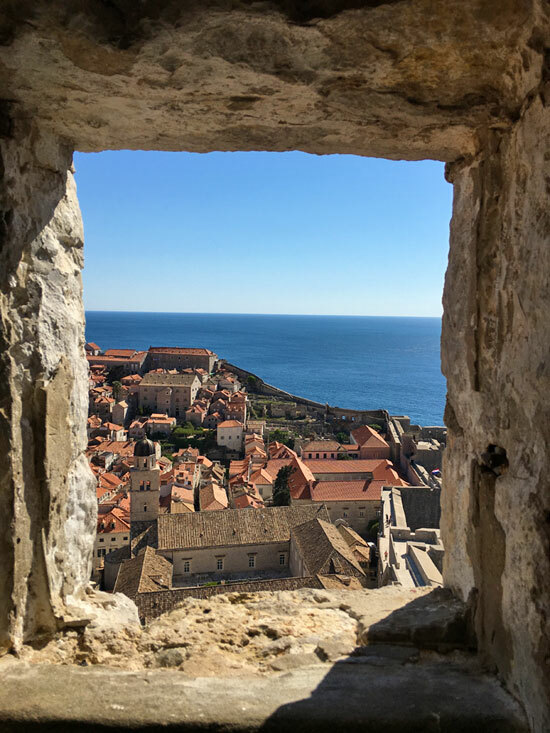 There’s way more to see and do in Dubrovnik- so we leave you with some more of the pictures we captured that do a much better job of sharing why we loved it than words ever could! If you’re planning to visit Dubrovnik, here are some fun day trips to consider while you’re there!